Social/political arguments of Malthus were adapted to biology (Natural Selection) by Darwin and reconverted back to politics by Social Darwinists. The ideas of Social Darwinists in turn became justifications for war, racism, exploitation, oppressive laws, eugenics and prejudice. Many mistakes and consequences of Social Darwinism were contrary to the Christian Scriptures. This suggests possible relationships between scientific theory, ethics and theology so that one discipline could assist another in the formulating of accurate conclusions or at least of hypotheses not so soon falsified. The following discussion shows how a political argument by Malthus was converted to biology by Darwin and how Darwinism in turn was converted back to politics in Social Darwinism which in turn provided a justification for racism, exploitation and oppression. "Darwinism" is the theory of the "Origin of Species" formulated by British naturalist Charles Darwin (1809-1882). The basis of Darwinism is that new species evolve from older species by means of "Natural Selection". Such successful or "fitter" variants will over three or more generations increase proportionately over the "less fit" and are said to be "selected". Continued selection of fitter variants over long periods is said to be the basis of evolution and the origin of new species and genera. Over even longer periods there emerge distinct higher categories – Families, Orders and Classes. Natural Selection would require long time periods for it to occur. The principle of "Uniformitarianism" by Scottish geologist Charles Lyell (1797-1875) was that the geological processes which operate today and the rates at which they operate is the way things have always been. From this it followed that planet Earth is old, very old, much older than the 6,000 years often calculated from the Bible. Lyell's Uniformitarianism therefore provided the long ages of time which Darwin believed would be necessary for the origin of new species. The notion that unchecked populations increase faster than food supplies originated with Thomas Malthus (1766-1834), a cleric and teacher, and was outlined in his Essay on the Principle of Population (1799). Malthus limited his argument to human populations. The argument was that increase in population is geometric (ie by a ratio or percentage) but increase in food production is arithmetic. Population growth will therefore outstrip food production and is naturally kept in check by poverty, famine and low living standards. Malthus' argument was political not biological. He was giving reasons why revolutions such as in America (1774) and France (1789) could not lead to improvement in living standards for the whole population. It was an argument against revolution and in favour of political stability and the status quo. Malthus' reasoning implied that human inequality was permanent and could not be changed by revolution. Famine, pestilence and war were inevitable and functioned as a check on population by removing the less worthy. From this it followed that health care, sanitation, safety measures for employees, education and general government assistance would only delay and ultimately aggravate the catastrophe. Therefore, anyone whose labour was unwanted by society, and whose parents did not support him, had no right to any help from society. This implied the additional political/social idea that a policy of general welfare would be counter-productive in the long run. However, since industry required the stimulus of large numbers of workers competing to obtain and retain jobs, Malthus was also against birth control. We see then that Darwinism contained some paradoxes. Social arguments which Malthus applied to humans were reapplied by Darwin to the evolution of animals. Arguments for keeping the status quo in Society were reused to emphasise change and struggle in nature. Arguments applying to groups were reapplied to individuals. And arguments for permanent inequality were reapplied to suggest that the degrees of inequality were ever changing. Furthermore, Darwin suggested two sources of variation. It makes sense to distinguish two suggestions only if the two are viewed as incompatible. Otherwise one suggestion would suffice. The action of the environment is, however, implied in both suggestions! Darwinism and the paradoxes in Darwinism provided analytical principles to thinkers trying to make sense of the rapid social changes and inequalities in 19th century society. Such thinkers drew an analogy between the survival of the fittest among animals and the survival of the fittest among human individuals, classes and societies. This analogy together with principles and policies based on it became "Social Darwinism". The idea that human societies compete and evolve by the same laws as animal populations implied an orderly change to a better future. It was a comforting belief for people "on top" who because of their position in Society could view themselves as among the "fittest". Before Darwinism could be applied to the social sciences Darwinism had to be generally accepted at least among the educators who would do such "applying". During the 1860s universities were starting to emphasise science in their curricula. This was fostered by the need for technicians in the Industrial Revolution. One science was biology and another was geology. Both required a new paradigm other than the Bible stories to guide research. Darwinism met the need and became part of biology and part of standard teaching. By 1870 Darwinism was generally accepted at leading universities and by many Protestant theologians. Social Darwinism was the theory that societies and classes evolve under the principle of "survival of the fittest." Natural Selection eliminated weak persons and groups. Most Social Darwinists were, therefore, against improving the conditions of the poor. To let nature reign was best in the long run. The theory in effect justified poverty and social stratification by combining Darwinism with individualistic and liberal values. Laissez-faire economics and the Industrial Revolution produced a large, underpaid, exploited wage-earning class. Capitalists grew rich and the poor stayed poor. Industrial nations grew into large empires and exploited colonies. In such a context the concept of "struggle" and "survival of the fittest" was a useful justification for exploitation. Furthermore, notions of "progress" permeated the industrial lands and seemed analogous to the "progress" in evolution. The word "progress" was the same but the meaning was different. When used in biology "progress" meant the adaptation of organisms to new environments; but when used by Social Darwinists it referred to increased wealth, factories, technology and power. Already in 1855 the French philosopher Auguste Comte (1798-1857 claimed: "The whole evolution of the race must proceed in entire accordance with biological laws, and the social phenomena must always be founded on the necessary invariableness of the human organism." Herbert Spencer (1820-1903) was an English philosopher who believed in evolution even before Darwin's "Origin of Species". Spencer directly adapted the principle of "fitness" to Society and argued that societies grow from an initial militant phase into large organized social units – from: "…an indefinite incoherent homogeneity, to a definite coherent heterogeneity." Perhaps getting his cue from the Biblical analogy of the congregation to a human body (1 Corinthians 12) Spencer compared Society to a body. The different parts of Society like the parts of a body cooperate to the good of the whole. But as Society becomes more complex different groups specialising in different tasks emerge – Labour and Capital for example. The result is social inequality. Social inequality, said Spencer, maximized fitness and to oppose it was to oppose evolution. Eventually a new human nature would evolve in which altruism predominated. Marx compared the class struggle to the struggle for existence in natural selection with the difference that the outcome occurred by revolution and not evolution. This translated Malthus' thesis back from biology back to politics but converted them into an argument for change rather than for stability. Sumner wanted the non-survival of the unfittest and therefore violently opposed helping the poor escape the slums, or changing dangerous work conditions, or helping them with medical bills. Poverty and wealth, Sumner believed, were part of the struggle for existence. Here we see notion of predetermined evolution as a justification for the unequal distribution of wealth. Society was like a superorganism and its progress depended on Selection. John Fiske (1842-1901) was a historian who popularized Darwinism in America in the 1870s. In A Century of Science he wrote: "There is no subject great or small that has not come to be affected by this doctrine." Social Darwinism ignored the sources of variation but emphasized the presence of variation on which Natural Selection acts. It was presupposed that there were natural inequalities which resulted in social statification. Then, by analogy with inheritance of property, it followed that social stratification should be perpetuated. Indeed, if certain qualities were inherently helpful to survival then variation from those qualities must be harmful and should become extinct. In this way evolution both of societies and in nature proceeded along predetermined lines. Darwin's ambiguity regarding the source of variation is reflected in Social Darwinism. If biological evolution required "peculiarities" in the reproductive system then improved variants could not be produced by changing the environment. Hence many Social Darwinists saw no need for social reform since such reform could make no difference. Alternatively, if acquired changes are passed on to offspring then social reform would be very important. Robert Ward (1841-1913) a founder (in 1894) of the Immigration Restriction League in Boston, and Thomas Huxley (1825-1895) an English biologist, took this latter view. Ward and Huxley accepted natural inequalities but were social reformers. They wanted inequality removed gradually by artificial selection. They argued that Society should assist the less fit but should also discourage their reproduction. Ward also believed that: "fitness to survive is something wholly distinct from real superiority". (Hofstadter p. 79) His own parents were lower class and Ward himself remembered ragged schoolboys getting better grades than the sons of the rich. Ward therefore believed that the masses had latent abilities which need development. One group influenced by Social Darwinism but opting for reform was the Fabian Society formed in 1884. The Anglo-Irish writer George Bernard Shaw (1856-1950) joined up in 1885 and introduced Marx to it in 1887. The Fabians rejected Marx's economic theory but agreed with his indignation at injustices of Capitalism. The Fabians chose a course of gradual change by means of parliament and saw it as their duty to supply politicians with information about industrial life. In the Fabian Essays (1889) we read: "in natural selection...the units selected from are not individuals but societies." This is another example of Natural Selection entering politics and being extended from individuals and classes to societies. The "struggle" aspect of Social Darwinism became a justification for industrialists and the military. The American railroad magnate James J Hill (1838-1916) declared: "the fortunes of railroad companies are determined by the law of the survival of the fittest." Darwinism is here clearly misapplied. "Survival of the fittest" originally referred to prolific individuals. Industrialists were not all prolific. To Darwin the idea of "struggle" was a metaphor. It referred neither to savagery nor to killing for the sake of killing, nor necessarily to acquiring goods, power or social status. Natural Selection referred to differential survival and reproduction irrespective of the causes. Some species practice altruism. Sometimes mothers die to protect the young. Many species have organized social entities including ants, bees, baboons, lions, etc. Peter Kropotkin (1842-1921), a Russian explorer, examined this topic (1902) in detail. In such species intra-group fighting is minimal and examples of cooperation are plentiful. This differs from the rugged individualism of Social Darwinist industrialists. The assumptions that success in business correlates with social or moral worth or that it measures biological fitness (i.e. prolificness) are wrong. Darwinian fitness must be distinguished from what humans evaluate as excellence. Social Darwinists, including industrialists, also ignored the fact that Darwinian Selection was related to the environment – individuals were "fit" with respect to certain environments. Environments vary from place to place and sometimes explorers died under conditions that indigenous peoples survived in! A logical problem arises from the meaning of "Natural" in "Natural Selection". To Darwin it meant that the process of Selection was independent of human choice. Therefore, since the successes of industrialists, colonial exploiters and national leaders involved decisions and choices by humans the results could not be "natural"! Many Social Darwinists regarded struggles between nations and races as he highest form of Natural Selection. Already in 1855 the French diplomat and racist Joseph Gobineau (1816-1882) proclaimed (in his Essay on the Inequality of Races) that North Europeans were the master race, superior in government, war, culture, civilization and intellect. Discussion about racial differences became common. Colonial exploiters were often justified as superior and as promoting culture. Darwin himself suggested in 1871 that the Whiteman would eventually erase the Black. In 1872 Walter Bagehot (1826-1877), a British economist, argued that inter-tribal and inter-nation rivalry was evolution by Natural Selection. War gives a biologically just decision. War is a universal law of nature. There were also doctrines of pan-Slavism and pan-Germanism. Later came Mussolini (1883-1945) who spouted Darwinian phrases and mocked peace lest it slow down evolution. The logical continuation of regarding certain races or nations as inferior is to regard them as economic or genetic liabilities and therefore worthy of extermination. The climax came with Adolf Hitler (1889-1945). After World War II the racist aspect of Social Darwinism became unpopular. The other view, that war tests the fitness of individuals, was undermined by the trench warfare of World War I. Episodes of machine-gun crews mowing down a hundred infantry before running out of bullets and surrendering were incompatible with both Darwinian fitness and conventional fitness. The third aspect, that war tests the fitness of nations became unpopular after 1945. Retaining the notion would have implied Russian genetic superiority and German and British inferiority (since Britain lost its empire and Germany lost the war). Furthermore, everyone was reluctant to test their presumed fitness against nuclear bombs! By 1900 Social Darwinism as a movement within the social sciences was in decline. Biology and ethics were being viewed as distinct. To militarists and industrialists "might" made "right". An act could be judged as to rightness or wrongness only by consequences. The logical conclusion was that the murderer, cheat, robber, exploiter, etc, who "got away with it" was "right", "fit" and "best" by definition. This view became untenable as ethics became a broader field and Kropotkin showed that cooperation within species was more common than aggression. 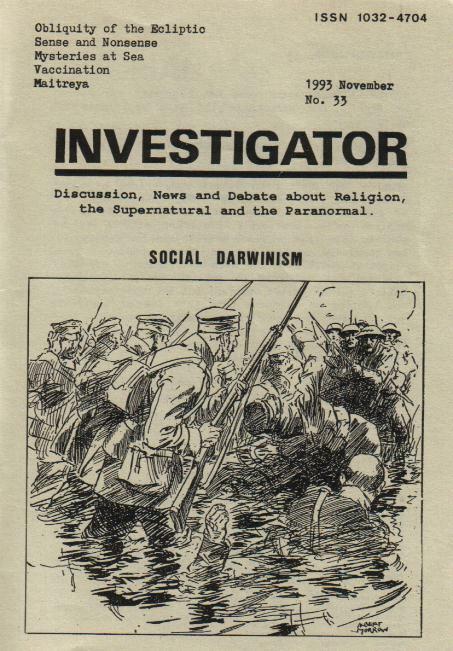 Furthermore, the activities of Ward, Huxley and the Fabians, together with Darwin's own ambiguity regarding what caused variation, suggested that Darwinism could be applied either way – to justify mutual help or aggression. Laissez-faire individualism fast faded as trade unions became respectable and gave workers a voice in the affairs of state and industry. The idea that societies evolve in unilateral fashion was also under attack. It became clear that different societies experience different changes or similar changes at different rates and this had more to do with environment, resources and opportunity rather than with inate superiority. Finally, the Social Gospel movement and other reform organizations were gaining popularity. Barnes (1970) provides a list and summary of reform organizations. Such groups opposed abuses of industrialization and believed in human freedom through which human existence could be regulated. Individuals in many sciences expressed similar beliefs. William James (1842-1910), a founder of modern psychology, believed in free will and peoples' ability to better themselves initially by choosing to do so. This was contrary to ideas of predetermined evolution. After 1900 Social Darwinism merged with the Eugenics movement. "Eugenics" is a word coined by Sir Francis Galton (1822-1911) a cousin of Darwin and a pioneer in using statistical methods to study heredity. Eugenics referred to improving the human race through selective breeding. It led to sterilisation laws in the USA between 1911and 1930 and fuelled the Nazi extermination policies. Eugenicists believed (wrongly) that all physical, mental and moral traits resulted from individual genes and so could be eliminated or concentrated in the population by controlling who mates with whom. Social Darwinism still persists via efforts to revive Eugenicist assumptions and biological determinism. These include Darlington (l966), Tiger & Fox (1974), Jensen's work on racial differences and intelligence (1973) and Wilson's Sociobiology (1975). Alleged genetic differences are still used to account for divisions of labour (skilled and unskilled) and for different roles of the sexes in Society. It may be, however, that environment including socialization and learning are as, or more, important than genetic differences. (Dyer 1982 chapters 6-7; Dobzhansky 1962 pp. 18-22) What seem to be inherited genetically are potentials and whether these come to fruition is subject to environment and choice. The book of Proverbs is based on the assumption that people have the potential to "know wisdom and instruction" and "acquire skill" and, by acting on knowledge, to minimize sickness and become prosperous. (1:2-6; 6:6-11; 8:34-36) One's success in life is not all predetermined by birth. Throughout the Bible is advice to help the poor especially the victims of oppression and exploitation. (Leviticus 19:9-10; 23:22; Deuteronomy 24:19-22; 15:7-11; Ruth 2; Proverbs 14:20-21; 28:27; Mark 10:21; James 5:1-6) Some Bible references almost sum-up the attitude of many Social Darwinists and condemn it! Malthus was wrong because emigration and technology kept food supplies ahead of population growth. Darwin was wrong in that he failed to define who the "fittest" are – he didn't list the characteristics which determine which individual will be most prolific. Due to this lack Darwin's theory boils down to the tautology that "those who survive are those who survive." Social Darwinists were wrong in ignoring the importance of cooperation and of environment and opportunity. Eugenics gradually lost out to the science of Genetics which proved its assumptions erroneous. If genes were irrelevant then humans would succeed (barring accidents) at whatever they chose – which clearly is not the case. Alternatively, if genes determined the qualities and situations of classes and nations, then attempts to improve society would be based on illusion. Malthus would be right.